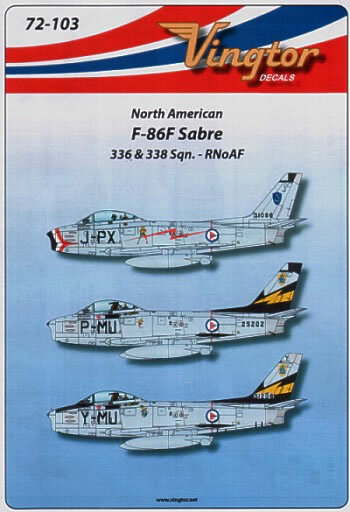 North American F-86F Sabre 336 & 338 Sqn. Royal Norwegian Air Force. 1 decal sheet plus an A5 sized instruction sheet each in a zip-locked bag. Interesting subjects, decals by Cartograph, full colour instructions, what more could you ask for? Aimed mainly at Norwegian modellers but for those looking for something a little odd, here you go. Vingtor is a Scandinavian decal manufacturer catering mainly for Scandinavian modellers, in this case, Norwegian Air Force enthusiasts. 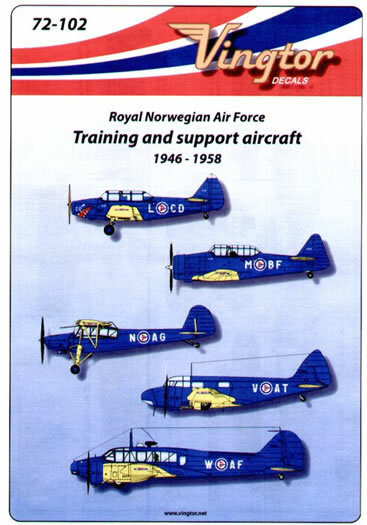 72-102 is Norwegian Training and Support Aircraft from 1946 to 1958. 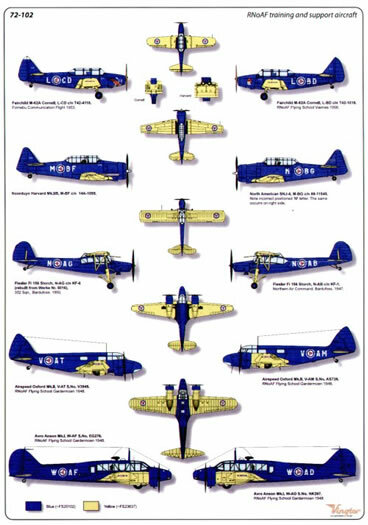 They are all in a dark blue fuselage with yellow wings and cover five types, Cornell, Harvard, Storch, Oxford and Anson. The centre of the four page A5 fold-out instructions has a left, right and plan view of each aircraft showing the position of each marking supplied. There are also notes on each aircraft on the back page along with colour notes. 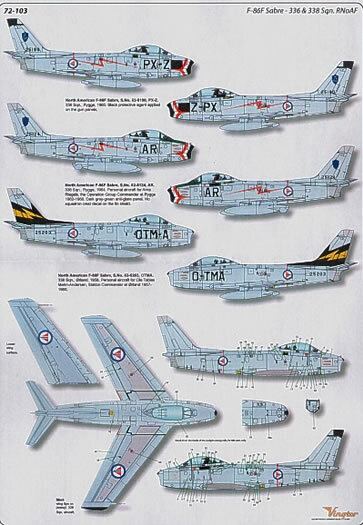 72-103 is for North American F-86F Sabres from 336 & 338 Sqn. of the Royal Norwegian Air Force. It covers six aircraft, three on the front and three inside but the decals actually have two full sets of numbers and letters so, providing you have references, you can do any aircraft from the two squadrons. Caution. Most of the aircraft were delivered with the unslatted, broad chord “6-3 wing” but were later modified with the long span, slattered 6-3 wing known as the F-40 wing. No Sabre kits come with this wing but almost all come with the earlier 6-3 (F-30) example. 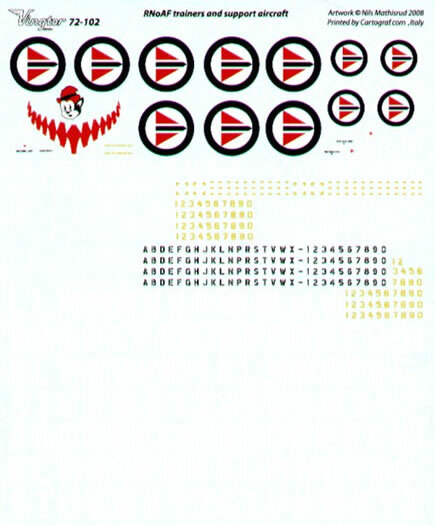 The decals also include two full stencil sets so two complete aircraft can be built from this sheet. Although these two sets appear to be aimed squarely at Norwegian modellers, many of us like to tackle some thing out of the ordinary and these will appeal to them very nicely thank you very much!